Edward J. Meixner, P.E., P.S. After serving for 10 years as Assistant County Engineer, Edward J. Meixner was appointed to serve out the remainder of Larry Chamberlain's term as County Engineer in March of 2000. That fall he was elected to his first full term. Educated at the Virginia Tech College of Engineering, Ed began his professional career with Bechtel Power Corp as a structural engineer. In 1989, he entered public service and became engineer for the City of Rittman, Ohio. As with all County Elected officials in Ohio, the powers of the County Engineer are granted by the Ohio state legislature and recorded in the Ohio Revised Code. The major role of any Ohio County Engineer is to administer gasoline taxes and vehicle registration fees in the maintenance of county roads and bridges For Ashland County that is 283 miles of roads and 237 bridges. The State of Ohio defines a bridge as a structure with a span of 10' or greater. Roadway maintenance duties include paving, patching, resurfacing, roadside mowing, brush cutting, snow plowing and drainage improvements. Bridges are regularly rehabilitated or replaced. Ed and his staff estimate, schedule and plan work needed to ensure the integrity and usability of the roads and bridges. Construction and maintenance projects are done by Highway Department forces or by competitively selected contractors. prepares an annual report to the board of commissioners that details the county roadway system's condition and the estimated cost of needed maintenance. Ed consults with township trustees regarding their road maintenance programs. He also participates in the Ashland County Planning Department's lot split process. Ed works with other county officials in their attempts to provide good service to the people of Ashland County. 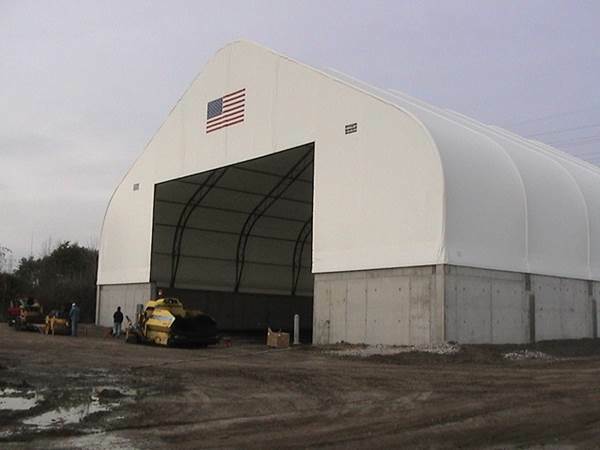 The Ashland County Engineer's Office and Central Garage are located on a 5.4 acre parcel at 1511 Cleveland Avenue, in the northeast part of the City of Ashland. The Engineer's Office was located in the Courthouse until 1979, when the present office building was erected. The main Highway Garage is just across the parking lot. In 1996 the old garage and equipment storage buildings were demolished and a new garage facility was built on the same site. The new garage, which covers 24,000 square feet, contains a 12,000 square foot vehicle storage area and a 7,000 square foot repair garage with four bays. The back lot of the property is used for materials and salt storage, while stone and road patching materials are kept on a nearby lot on Twp. Rd. 1175. The Highway Department had a southern garage outpost located in Loudonville until 1999. At that time the Commissioners purchased an existing building and 2.1 acres just outside of Perrysville. Vehicles are stored in the building and stone and salt are stored on-site providing the necessary support to the southerly part of the county for road maintenance and snow and ice control. Dziak leads the tree cutting and brush cutting crew. This is very hazardous work involving the use of chainsaws. Compounding the inherent danger of chainsaw use is the fact that Dziak and his crew do this work in emergency situations that often occur at night and/or under adverse weather conditions. In 2005 Ashland County experienced heavy winter storm damage resulting in the need to clear a lot of trees and brush from the roadways. Despite the large amount of tree removal done under icy conditions there were no lost-time accidents reported. 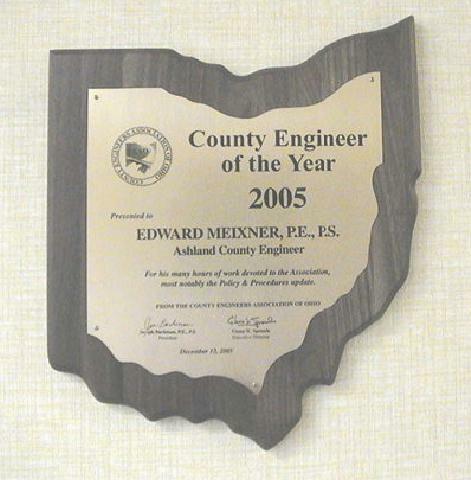 This award is the highest form of recognition and is given by the CEAO to the Ohio County Engineer who has made the largest contribution in the area of county engineering. 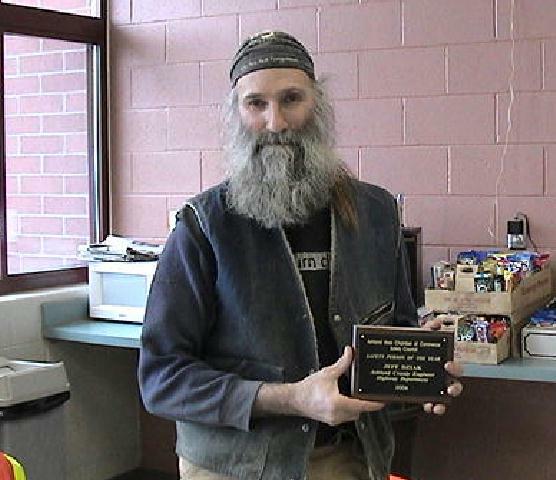 Seneca County Engineer, James R. Nimz nominated Mr. Meixner for this year’s award. Mr. Nimz’s nomination is based on Mr. Meixner’s work as Co-Chairman of the Policy & Procedures Committee of the CEAO. This committee’s responsibility was to revise the current Policy & Procedures Manual in an effort to standardize practices within County Engineering departments across the state as to engineering, maintenance, personnel, and operational practices. Newly built in 2005, our salt shed was one of ten salt storage facilities acknowledged for its environmentally friendly design. The above information is based on data provided by the Ashland County Board of Elections, Mr. Larry Chamberlain, Joe Mason, Esq, and the booklet: Inventory of the County Archives of Ohio, No. 3, Ashland County. Dates used reflect dates in office rather than dates elected. Lame duck January is not included as year served.